From March 4-31, I'm offering an asynchronous eCourse on copyright through ALA Publishing eLearning Solutions. 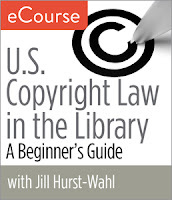 After giving copyright webinars last year through ALA, I'm please to have been asked to deliver a four-week course entitled "US Copyright Law in the Library: A Beginner's Guide eCourse." The description is below. Registration information is on the ALA website. The four weeks of course material, including materials to extend your learning, will provide approximately 28 hours of learning activity. 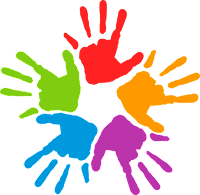 Participants will be able to interact with each other - and with me - during the course. I'm looking forward to the library-related copyright discussion that will develop! The library is a hub of content, all of it subject to copyright law. The legal reality of copyright is dynamic—changes in technology have created a landscape that is constantly adapting and can be difficult to predict. If you don't have any formal training in copyright law, it can be intimidating to know how to answer your patrons' copyright questions and to know what you can and cannot do with your library’s content and resources. It can be tough to understand the line between providing information and answering a legal question. In this new eCourse, consultant, speaker, writer, and educator Jill Hurst-Wahl guides you through the basics of copyright law and provides you with the foundation to become your library's copyright expert. Each week, you'll learn how copyright law informs what libraries, library staff, and patrons can do with their materials and how you can stay up-to-date as this area evolves. You'll be able to check and affirm your knowledge through focused self-assessments. ...and important discussion points and nuances. If the repair of digital devices interests you or your community (including what might happen in makerspaces), be sure to give this article a read. In December, I wrote here about the iSchool Public Libraries Initiative (IPLI), which I began earlier in 2018. On February 7, Library Journal published an article by me about the IPLI, with contributions by MSLIS student researchers Heather Elia, Georgia Westbrook, and Sabrina Unrein (Unmanaged Mischief on YouTube). The LJ articles gives a peek into what we have been doing. In the coming weeks, we'll be building out our website, with the goal of placing the results of our work there. Yes, we will also be using social media, and are deciding which social media platform will be the best. (We do not want to spread our social media efforts to thin.) I encourage to bookmark our website and check it for updates. I am currently on three search committees. While understanding what a candidate can be asked legally (for example, Minnesota State and Monster.com), it is also important to ask questions which help the search committee understand the candidate's views on specific topics. One of those topics is diversity. These are sample interview questions from Northern Illinois University on diversity and equity. I'm placing them here, so I can find them later. And they also might be of help to you. Our recent history has shown that a person's understanding of diversity, equity, and inclusion should not be assumed. Yes, be willing to ask questions of candidates about this, rather than being surprised.